We have 44 hotel-style guest rooms, up to triple-occupancy. Each guest room includes: two extra-long twin beds, sofa sleeper, table, chairs, and a private bath. All linens are provided. 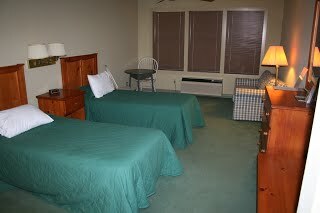 Two of our guest rooms are handicap-accessible. Walker, shower chair, transfer board, and one manual wheelchair are available upon request. Equipped with showers and lockers, the Lodge can accommodate youth groups overnight as large as 120 youths and leaders. 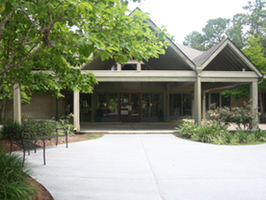 Our one-story residence hall is a set of four buildings positioned in a square with a bonfire area in the center. All 24 rooms face the bonfire area. 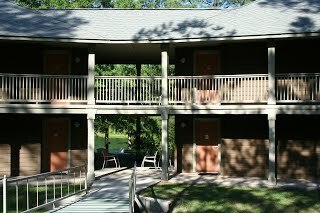 Our two story residence hall is peacefully located on a walking path that leads from its open breezeway to a bonfire area and out to the lake. It features a two staircases, connected by open breezeways on both floors with patio furniture for enjoying the outdoors.